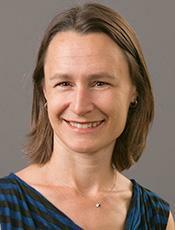 Jennifer Ahern, assistant professor of epidemiology at the UC Berkeley School of Public Health, has been awarded a 2013 High Risk-High Reward Research grant from the National Institute of Health (NIH). Each year, NIH distributes these grants to support exceptional innovation in biomedical research. “NIH is excited to continue support of visionary investigators, among all career stages, pursuing science with the potential to transform scientific fields and accelerate the translation of scientific research into improved health,” says NIH director Francis S. Collins. The award will fund Ahern’s work to develop and apply a new system to determine the health and disparities impacts of policies and programs. She plans to create a web-based simulation generator to identify the optimal study design and analysis approach, and to use a large database of over 10 years of population health data to estimate health effects. Once developed, Ahern will use the system to assess the health and disparities effects of criminal justice policies and programs in California: specifically a violence program implemented in Oakland, and the criminal justice realignment that was mandated statewide. She also plans to develop new collaborations to assess the health effects of other policies and programs in California over the course of the project. The NIH High Risk-High Reward Research Program is supported by the NIH Common Fund. Common Fund programs are designed to overcome major research barriers and pursue emerging opportunities in biomedical research.